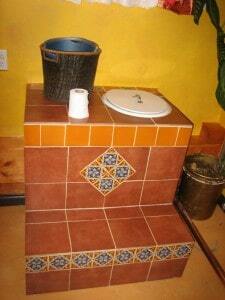 Goals: To have a waterless composting toilet that was functional and beautiful. Site description: The bathroom is on the first floor and has a concrete slab beneath the floor, there is no space at all below! The toilet is used by 4 people on average. This home-built composting toilet is basically a wooden box that has been tiled. The box encloses a 5 gallon urine collection container and a 5 gallon feces collection container. The entire box is sealed so no air or odor comes into the bathroom. Woodshavings from a local woodworker are added after each deposit, and toilet paper is added as well. The lid to the toilet seat has a ring of foam insulating tape (for window insulation) to keep odors out of the bathroom. 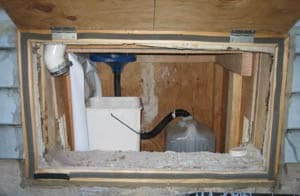 A hatch was cut out of the house to create an access space to remove and empty the urine and feces containers. The blue bit protruding downwards is the bottom of the urine diverting toilet insert. The floor of the toilet enclosure has a water proof barrier in case of spills. The vent for the enclosure is on the left side and is screened to prevent flies from entering. The vent for the enclosure is a 3 inch PVC vent (this vent is smaller than the recommended size) and is spliced into the preexisting upstairs bathroom’s toilet vent farther up the wall of the house. The vent goes up to the top of the house. This is a passively vented system, but an electric outlet was installed near the toilet in case an electric van was desired later. So for passive venting has worked well. 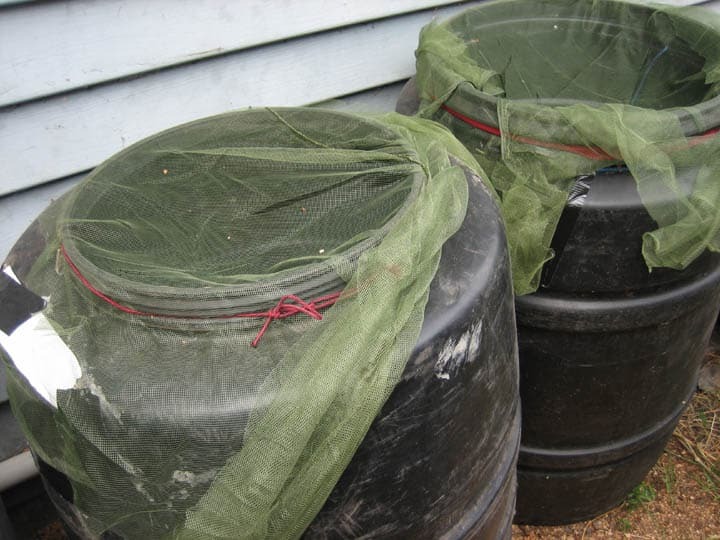 The feces are emptied into feces-only compost barrels that are vented and covered with fly netting. They are protected from rain by a tarp in the winter time. The feces compost for a full year before they are used in the landscape. When one barrel is filled it’s set aside for the year and another barrel is used. For four people three of these 55 gallon barrels are used in rotation. 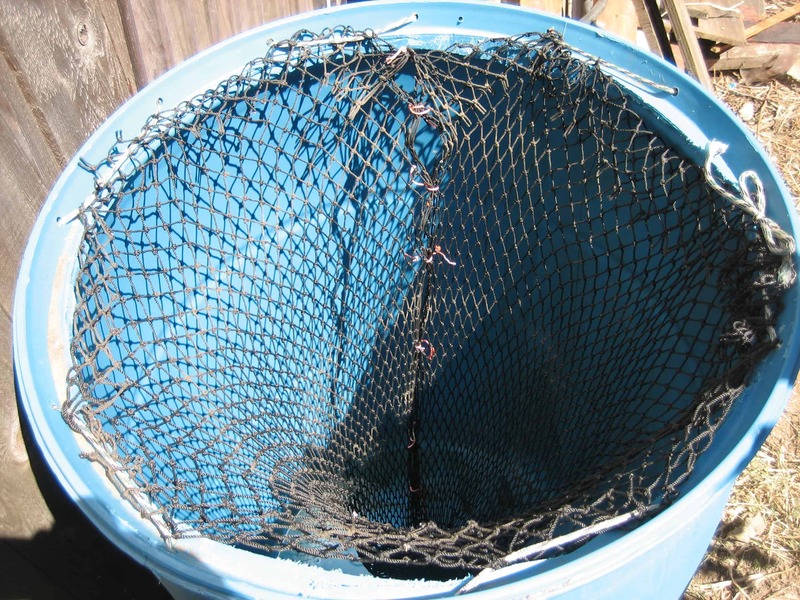 Two barrels have a hanging net like the one pictured. The net allows for air flow around the composting feces and prevents anaerobic conditions. 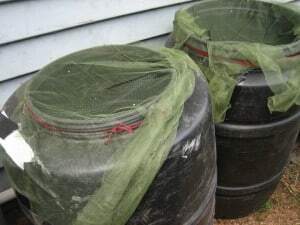 The barrels that have the net compost more quickly than the one that doesn’t. The unnetted barrel needs to be turned occasionally (a compost crank is used) to aid the process. The concrete slab and the cement foundation affect the size of collection containers. 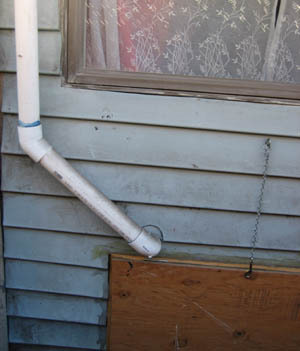 The urine collection could happen outside of the house, a small hole would need to be drilled for the tube to come out and the collection container could be outside or slightly below the ground with a cover. The feces and urine containers need to be emptied and cleaned weekly. If the container’s were bigger this could be less frequently. Due to the small size of the feces collection bucked urine sometimes spills over the lip of the diverter and drips down. If a larger container were below it would catch these drips. Currently a plastic tray is placed below to catch them and is washed weekly.